Guinea fowl have unique personalities and traits that are similar to those of a chicken in some ways but quite distinctive in others. Because guineas are so unique, they can make an interesting addition to your backyard flock -- but they can also be a bit of nuisance if you are not properly prepared to care for them. Guineas are not typically used for large, commercially based food production operations, but they can be used similarly to other types of poultry. Guinea hens produce edible eggs that can be cooked and eaten just the same way that chicken eggs can be used. According to the Food and Agriculture Organization of the United Nations, guinea hens lay eggs seasonally. The FAO states that a normal guinea hen will lay approximately 60 eggs a year when kept in a free-range living situation, and that hens can lay up to 200 eggs each year if kept in conditions designed to promote and extend their laying season. Guinea hens can also be used for meat production. 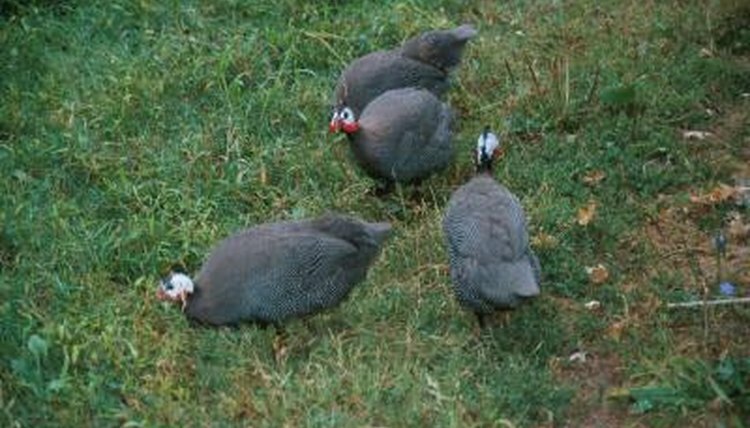 Guinea hens are very useful for controlling pests on your property. Guinea hens will kill and eat bugs, ticks, small snakes and other pests, keeping your yard and garden relatively pest-free. Guineas are also good at letting you know about everything that is going on in your yard; it is often said that guineas make good guard dogs because they noisily announce any visitor who sets foot on your property. Guinea fowl are loud and can quickly become a real problem with your neighbors. If you have close neighbors, they may not appreciate the constant racket your guinea hens are going to make. Guinea fowl can and will fly. They may choose to roost in your trees, or fly right over your fence and roost in the neighbor's trees. Guinea fowl are notoriously difficult to contain and have a tendency to wander and explore for quite a distance. Guineas have to be trained to stay in a coop and to return to the coop regularly; training is typically provided by keeping food in the coop as well as by containing the guineas in the coop for at least six weeks after they arrive at your home. If you purchase a flock of guineas, you can expect to spend some time tracking them back down, corralling them off your neighbor's property or trying to chase them back into your yard from the road.